When Sybil and Blanche Le Fleur were growing up in idyllic Burma in the 1920s and '30s, little did they realise the changes and challenges that they would face during their lives. With the death of first their mother and then their father, they had to cope with enormous personal tragedy, including the loss of all their family wealth. Then the Japanese bombed Rangoon on the 23 December 1941. Sybil managed to get out of the city, but there was no way for her to return to her sister, or even to know if she was still alive, as the death toll was very high. While Sybil escaped from Burma and settled in Scotland after marrying a Scottish soldier, Blanche lived for over three years under Japanese occupation. After leaving for India in 1958, Blanche made a new life while still thinking of and praying for her sister. Decades later, a chance set of circumstances led to the discovery by Sybil's son that Blanche was alive and living in India. 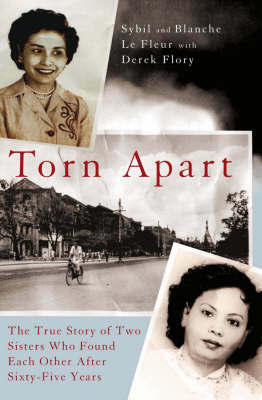 Torn Apart is the heart-rending, inspirational account of how the Le Fleur sisters lived separate lives for more than 65 years before an emotional reunion brought them together again in 2007.